Sometimes we know exactly what we are going to order on Date Night before we go on our date. Sometimes, as the song goes, “you can’t always get what you want.” In our search for the “Best Hamburger in Atlanta”, we decide to pop into Holeman and Finch in South Buckhead to see if their burgers are as good as the hype. There’s only one problem: they don’t serve the burgers until 10PM, and we are there at 5PM. They only make 20 burgers a night, and it’s supposed to be quite the show when the burgers are ready. You can also get them at Sunday brunch, but as we know, it’s Friday, so we are “shitake” out of luck tonight for a burger. That’s OK, and we start to study the menu, which looks as trendy as the eating space. 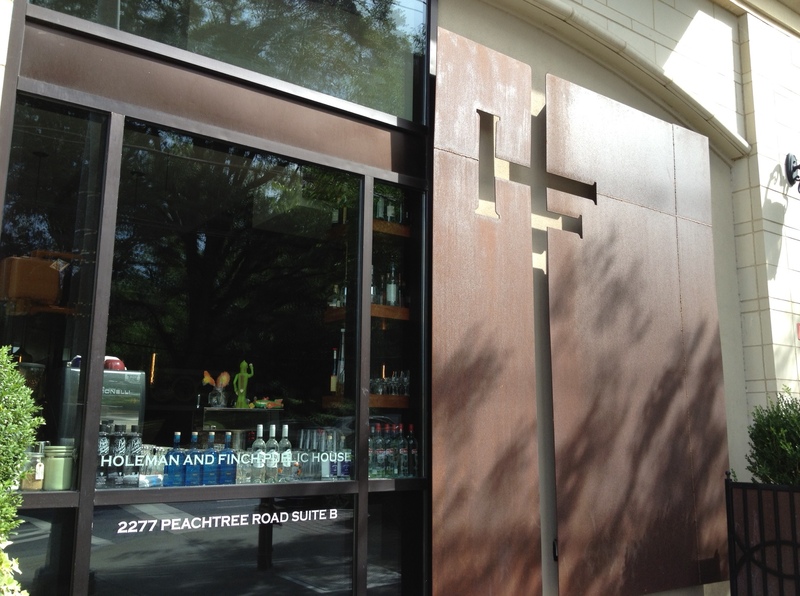 Trendy means hard to find, so look for this on Peachtree. H+F is another “farm to table” restaurant, which uses fresh, local produce. Our waiter, Chris, is very excited about the menu, and he also likes our beer selections, an Ommegang Witte and, just into Atlanta, a Sunny Haze hefe (in a can!) from Mother Earth Brewery in North Carolina. 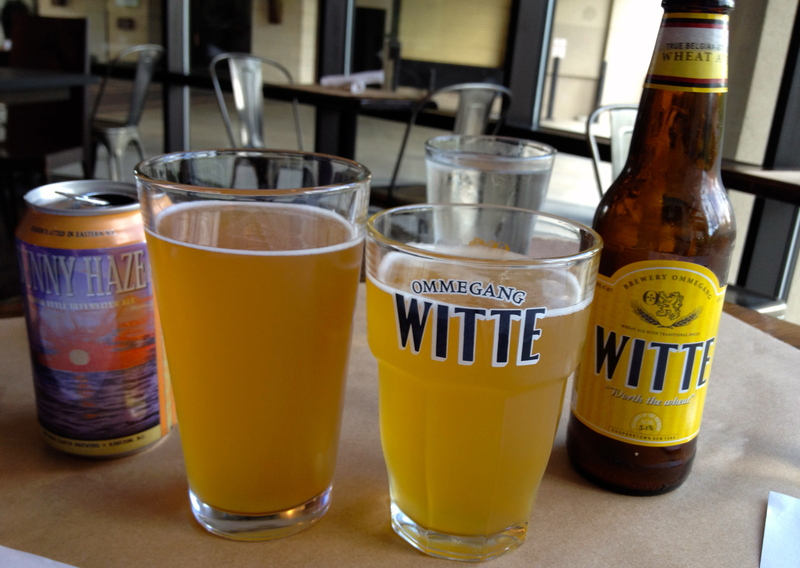 It’s really hot outside and these wheat beers are just the thing to cool off on a Friday afternoon in Hot-Lanta. The proper pub gives you a glass to match your beer! Pretzels are the perfect beer food. 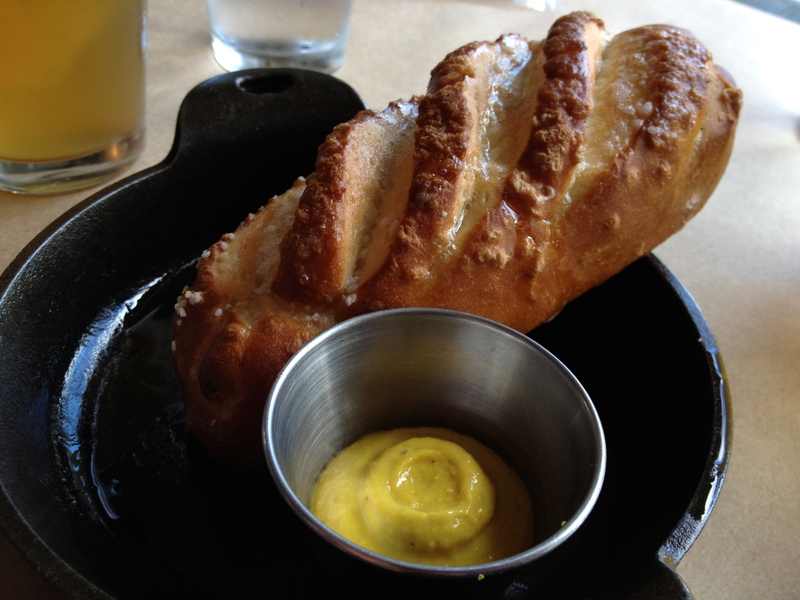 The pretzel is warm and salty and goes perfect with the beer. 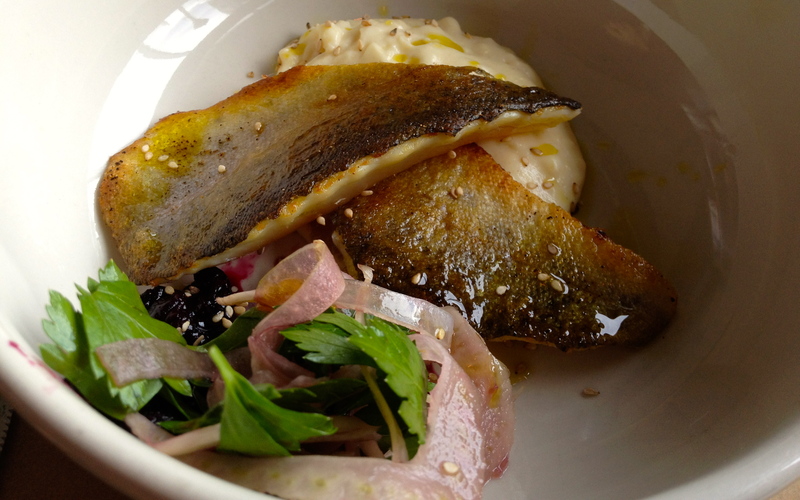 Most of the menu is made up of small plates, so the dishes are perfect for sharing. 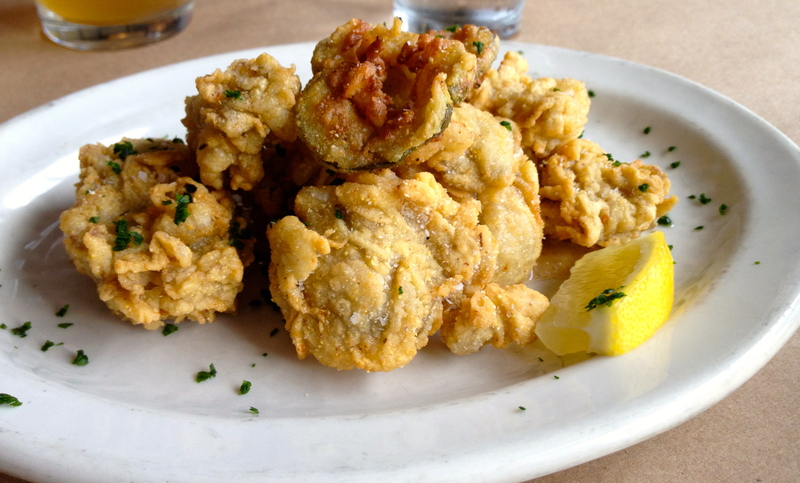 Next up is a plate of fried oysters. Perhaps the juiciest, most tender oysters on the planet! These have to be the most juicy oysters this reporter has ever eaten, and we are so far from the ocean. I could have eaten another order of these, but there are other things to try. A plate of citrus cured mountain trout finds it’s way to our table. As close to fresh-caught as you can get. That’s blackberry jam and spoon bread on the plate with the trout. Think of the spoon bread as a creamy polenta. This plate is perfectly prepared, and I could have eaten a lot more of this too. 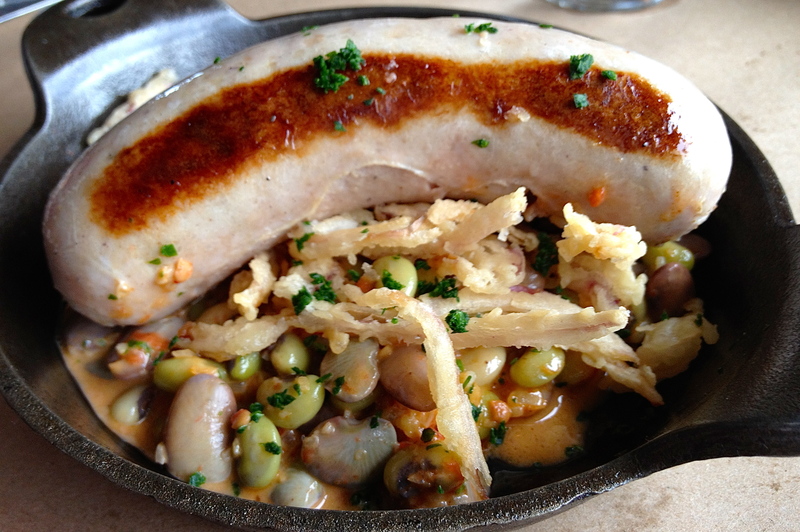 Speaking of Wisconsin, they love their bratwurst there, so we order the H+F version of this German favorite. House-made brat was home-made good! We don’t like to use a lot of superlatives on Date Night, but like the oysters, this is one of the best brats we have ever had. It was so moist in the middle, and the butter beans were the perfect compliment to the dish. They make and stuff the brats in house and they really nailed this dish. We’re not done yet, and after four small plates, we still have room for dessert. Have we saved the best for last? Desserts don’t get much better than this one. 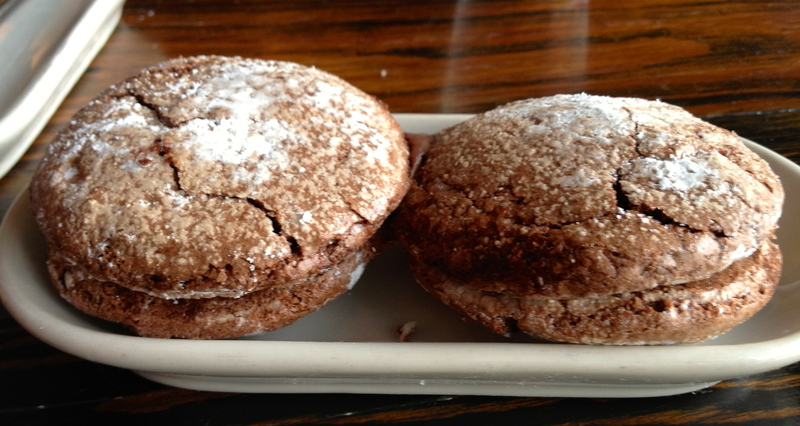 Chris tells us we can pick these chocolate macaroons up and eat them like a cookie. The chocolate ganache in the middle oozes out as we savor every bite of this delicacy. The check comes and Date Night this week is very expensive. Someone has to pay for the chrome and wood decor in Buckhead, and tonight it looks like it’s going to be us. This food is worth it, though, and we can’t wait to come back and get our hands on one of those burgers!